January is National Stalking Awareness Month, and victim advocates across the country are using this month as an opportunity to educate the public about the pervasive crime that affects nearly 1.4 million Americans a year. Stalking – typically defined as a course of conduct directed at a specific person that would cause a reasonable person to feel fear – is a criminal offense under the laws of all 50 states, the District of Columbia, and the federal government. Although its prevalence is high, public awareness that stalking is a crime remains dangerously low. One in 12 women and one in 45 men will be stalked in their lifetime, for an average duration of almost two years. Seventy-six percent of female homicide victims were also stalked prior to their death, and more than half of these victims reported stalking to the police before being murdered by their stalkers. National Stalking Awareness Month, intended to increase the public’s awareness of stalking, was motivated by the death of Peggy Klinke, a stalking victim who was murdered by an ex-boyfriend after repeatedly seeking law enforcement intervention. ••	1,006,970 women and 370,990 men are stalked annually in the United States. ••	77 percent of female and 64 percent of male victims know their stalker. ••	87 percent of stalkers are men. ••	59 percent of female victims and 30 percent of male victims are stalked by an intimate partner. ••	81 percent of women stalked by a current or former intimate partner are also physically assaulted by that partner. ••	31 percent of women stalked by a current or former intimate partner are also sexually assaulted by that partner. ••	73 percent of intimate partner stalkers verbally threatened the victims with physical violence, and almost 46 percent of victims experienced one or more violent incidents by their stalker. 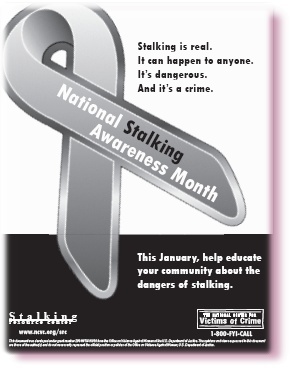 ••	The average duration of stalking is 1.8 years. ••	When stalking involves intimate partners, the average duration of stalking increases to 2.2 years. ••	61 percent of stalkers made unwanted phone calls; 33 percent sent or left unwanted letters or items; 29 percent vandalized property; and 9 percent killed or threatened to kill a family pet. ••	28 percent of female victims and 10 percent of male victims obtained a protective order. Of those, 69 percent of female victims and 81 percent of male victims had the protection order violated. Women’s Self Defense Institute is encouraging you and the State of New Jersey to promote awareness and public education about stalking during the month of January and throughout the year.